For the past few years I’ve done a gift guide before Christmas. This year I told myself that I just didn’t have time to pull everything together (somebody cue the sad trombone) – but then I remembered Abby. And I felt some gift guide-related hope. I think I first met Abby when she was in eighth or ninth grade; some junior and senior girls that I knew always talked about how they loved Abby’s sense of style. As I got to know Abby over the next few years, I quickly learned that she is even more beautiful on the inside than she is on the outside. Plus, I absolutely adore her family, and I want to be just like her mama when I grow up. Her people are the real dadgum deal. Earlier this year Abby (who is now a married 20-something, so clearly I AM ANCIENT) and her friend Casey started a style blog called Mignonne, and I loved it from the first time I read it. Abby and Casey are so genuine and fun and joyful; they really see fashion as a way to express who you are – not a way to pretend to be someone you’re not. That’s a mighty big distinction in my book. SO. Last week I asked Abby and Casey if they’d like to do the gift guide for my blog this year because, well, they’re darlin’, and I thought it would be fun for y’all to meet them. I was so happy when they said yes. They’re a great source of ideas for those of us who wonder what “the kids” are enjoying these days, and best of all, every single gift is under $25. HOORAY! Here’s the first round of Abby and Casey’s fabulous Christmas finds. 1. SHE & HIM: Vinyl is a great gift option for any of your trendy acquaintances. Urban Outfitters has a wide range of them for sale in stores and online. 2. STAG HORN SERVERS: For the outdoorsy hostess! 3. OTK SOCKS: An essential in any wardrobe, these tall socks will make any lady smile. 4. RANGEMARK HEADBAND: I love receiving handmade gifts. These artisan made headbands come in various patterns and colors. 5. KATE JOURNAL: Every girl loves Kate Spade, but usually can’t afford her price tag. This journal will let you have a little Kate in your life without breaking the bank! And of course the gold stamped idiom on the front provides us with a good piece of advice that I personally live by: “Eat Cake for Breakfast”! 6. MAN CANDLES: Manly and handcrafted candles for your manly friend! 7. FRENCH CARDS: Of course, we love anything Parisian… A perfect gift for your chicest friend! 8. RAVEN+LILY: Gift giving is more fun when it is the gift that gives back! This jewelry company is an amazing organization and it doesn’t hurt that their jewelry is also amazing. 9. NAIL POLISH: Because who doesn’t love a little glitter?! 10. RETURN ADDRESS: For your friend that is thoughtful and sends lots of Snail Mail! Stay tuned on Monday for the next 10 gifts! Happy shopping and have a very Merry Christmas! So here’s the thing that I’m a little bit embarrassed to tell you: for the longest time – for most of my life, really – I would see pictures and videos of people living in extreme poverty in this country and in other parts of the world, and my first reaction would be to fight my inclination to care. Honestly, I was scared to care. I was scared of how caring would change me, of how it would wreck my priorities, of how it would take everything that I’d always thought I’d wanted and render that stuff absolutely meaningless. So I would look at the pictures and watch the videos and nod my head and occasionally feel a tug at my heart, but that was as far as it went with me. It wasn’t that I was callous, but on some level I was pretty dadgum obstinate about not wanting to get pulled outside of my comfort zone. Sometimes it’s just easier to stay insulated in our shiny happy suburbias, you know? And yes, in case you’re wondering, I do believe that God occasionally enjoys the use of ALL CAPS for emphasis. The trip to Uganda was life-changing for hundreds of different reasons. It was every bit as difficult as I expected that it would be, mainly because the depth of poverty was shocking to me. It was profound. But I have to tell you: in the midst of those heart-breaking circumstances, I saw so much hope. I saw the beauty that happens when Light shines on dark places. And I was reminded that Joy – deep, lasting, eternal Joy – doesn’t necessarily shine brighter in poverty-stricken areas, but it’s definitely more noticeable when it’s not surrounded by all the junk and the stuff and the things that I tend to cling to in my safe little day-to-day life. I believe that’s what you call a lasting life lesson, my friends. On our last day in Uganda the people in our group shared communion on the banks of the Nile River. And as we stood in a circle and prayed together, a guy named Shaun Groves – the guy who dreamed up the whole crazy notion of taking a bunch of bloggers to Uganda and then setting them free to blog about what they saw and experienced – began to sing a song called “Kingdom Coming.” Well, “Kingdom Coming” is one of the songs on Shaun’s new CD, Third World Symphony, and I asked him if he’d do me a big ole favor and sing it for y’all. It never fails to encourage me and remind me of the grace of the Gospel. I hope it does the same for you. Kingdom Coming for Sophie at BooMama.net from Shaun Groves on Vimeo. It’s overwhelming sometimes to look around the world and see the extent of people’s spiritual and physical needs. In fact, it’s easy to feel discouraged and think that there’s absolutely no way that we can make a difference. I know that most of us are trying our best to serve our families as much as we can and as well as we can, so it’s not always possible to spend big chunks of time serving people outside of our homes, whether those people are in our own cities or across the ocean in a third-world country. But what we can do – what is oh-so-possible and oh-so-practical – is to support people like Shaun. His CD sales make it possible for him to continue to get in front of large groups of people and tell them about the work Compassion is doing. And when he tells an audience about Compassion, many of those people will respond by sponsoring a child who’s living in poverty. That sponsorship ensures that the child will have all the medicine they need, all the clothing they need, all the school fees they need. And most importantly, that sponsorship ensures that the child will be involved with a local church where they’ll hear the truth and the hope of the Gospel over and over again. It’s life-changing. It’s life-giving. And if you ask me, that’s a mighty good return on a a $9.90 investment. Oh yes ma’am it is. If you’d like more information about Shaun and his ministry, be sure to check out his blog. And if you’d like to buy your very own copy of the (most excellent) Third World Symphony, you can do that on iTunes or on Shaun’s website. Thanks, Shaun, for doing what you do. And thanks, bloggy people, for being so willing to help him. Warning: this post is obnoxiously long. If you’re going to read it, I’d suggest grabbing a water and perhaps a light snack before you get started. Feel free to take breaks as needed, and by all means, pace yourself. A few months ago my friend Merritt suggested that I might benefit from a 40th birthday do-over. Please don’t misunderstand: there was nothing wrong with my 40th birthday. My little family made the day super-special for me, and I enjoyed every bit of it. But way deep down – and I’m not telling you anything that my husband and I haven’t discussed a thousand times – that particular birthday really made me miss my high school and college friends. I missed them like crazy, in fact. And when missing-the-friends on the birthday got compounded with missing-the-extended-family on Thanksgiving, Christmas and New Year’s (sometimes life doesn’t cooperate with my holiday plans), I pretty much hobbled into 2010 carrying a big ole bag of lonely. If not for the Lord, The Proposal and seasons 1-3 of Friday Night Lights, there’s not a bit of telling what would’ve become of me. So when Merritt suggested the do-over, I remembered the early 2010 sadness and immediately agreed. I thought it was a FINE idea, and if nothing else it would be a great excuse to get together with some of my closest friends. After a few rounds of emails, we decided that we’d all meet at Merritt’s house in Houston the weekend of my 41st birthday. I couldn’t wait. Now I am well-aware that there are times in life when anticipation can overtake all reasonable expectation, but let me tell you: there is no way I could have ever anticipated how much this past weekend was going to mean to me. OH MY WORD YOU HAVE NO IDEA. I mean, being able to hang out with eight people I love with all my heart? And laughing until I hurt? And feeling safe to share the silly stuff and the deep stuff and everything in between? I don’t even know how to describe it, but “grateful” would probably be a pretty good starting point. It was the best. THE BEST. 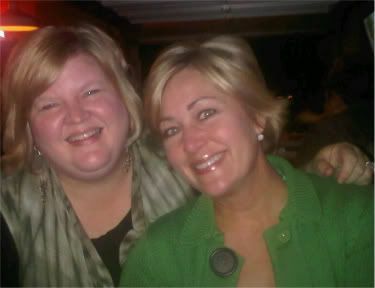 I flew to Houston late Thursday afternoon and met my friend Daphne, who was on a different flight, at baggage claim. The thing about Daph is that it usually takes us four seconds to start laughing about something, so we laughed as we waited for Daph’s luggage, and we laughed when Merritt’s hubby (true story: I set up Merritt and S. in college, and they’ve now been married for approximately seventy-four years) picked us up from the airport, and then we laughed all the way to Merritt’s house. This pattern didn’t vary very much over the course of the weekend. 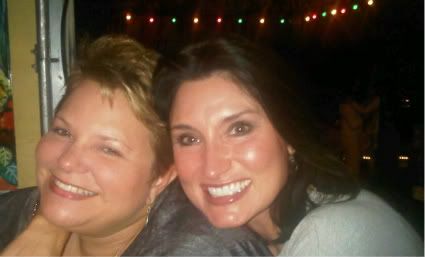 My sweet friend Melissa – who I’ve known since we took ballet together when we were six – was waiting at Merritt’s, and the thing about Melissa is that she is sunshine. It made me teary-eyed to see her and Merritt, and as soon as Daph and I put away our suitcases, the four of us headed to supper. We went to Ruggles Green and had what was probably our most healthy meal of the whole weekend (believe me – once we introduced Mexican food into the equation, the healthy factor went downhill and fast). We had to SCREAM to hear each other because the restaurant was packed and the ceiling was about 20 feet high (and, if the acoustics were any indication, MADE OF TIN), but we still managed to laugh ourselves silly. It was a great kick-off to the weekend. Friday the rest of the crew rolled into town (we missed you, Liz! ): Melanie and her new bangs, Emma Kate, Elise, Tracey and Wendi. 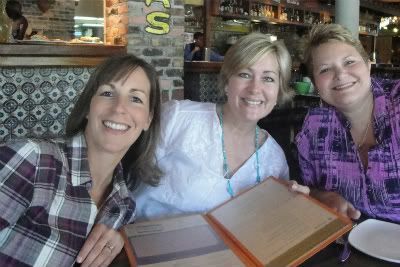 The last three were getting to Houston a little later than the rest, so EK, Melanie, Daph and I went to lunch while Merritt tended to some stuff at home. As some of y’all know, Melanie and I have a horrendous track record of finding the absolute worst Mexican food imaginable (huevos rancheros in Atlanta, salsa made of fire in Charlotte, lettuce-y nachos in Perdido – I could go on and on), but after our trip to Escalante in Houston, I can say with great certainty that THE STREAK HAS BEEN BROKEN. 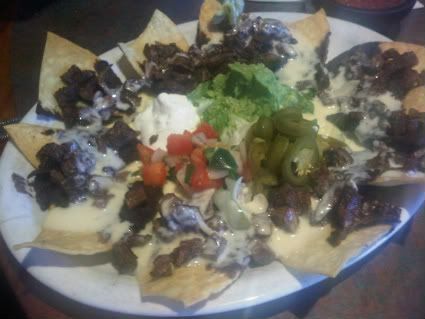 We also shared some nachos, and the steak was divine. DIVINE. I think the marinade must have been made in heaven and then exported to Houston. So good. And the company wasn’t bad, either. I thought over and over about how brave Melanie was to show up for a weekend with a bunch of girls who have known each other since they wore bows in their hair and Battenburg lace collars on their dresses. But let me tell you: she did not miss a beat. She was instantly adored by all, and it made my heart so happy for her to be there. It was also very convenient, because if she hadn’t been there we would’ve had to talk on the phone for at least two hours every night to catch up on everything that happened. It was a lot easier to just lean over and talk to her at the table or in the den or wherever. Late Friday afternoon Elise, Tracey and Wendi got to Merritt’s, and I was so happy to see them because 1) I love them and 2) they CRACK ME UP. Friday night we went to Brio, and here was my view from the end of the table. As Martha would say, they are all just perfectly beautiful. PERFECTLY BEAUTIFUL! I should probably take this opportunity to apologize to the patrons of Brio, because y’all, we were loud. LOUD. REALLY LOUD. 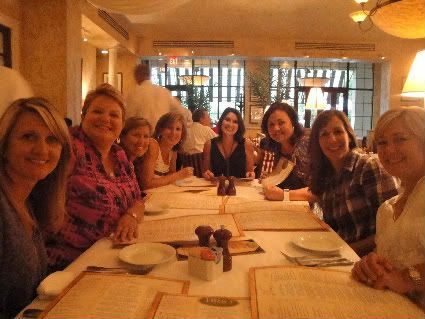 It wasn’t deliberate – it was just the natural outcome of a table full of girls who haven’t seen each other in awhile. Oh, it was big fun. We didn’t stay up too late Friday night, and I’m glad because Saturday may have been the most perfect day of my life. 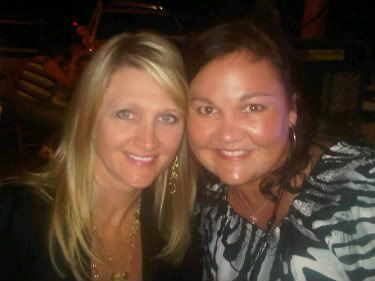 Mel, Merritt, Melissa and I got pedicures that morning, and then we all headed over to a place called Beck’s Prime Sportatorium to watch the Mississippi State game. Melanie told me that the burgers there were delicious, and SWEET MERCY she wasn’t kidding. 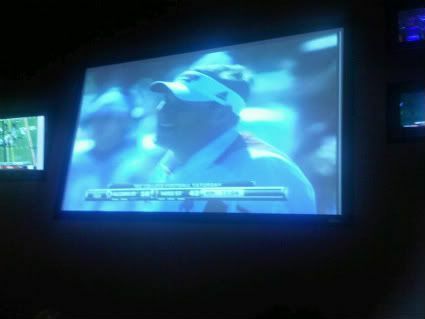 It was such a great place to watch a football game. The MSU alumni chapter was actually having a little gathering there, and about ten minutes after we sat down, the guy who was Student Association president our senior year at State walked in. 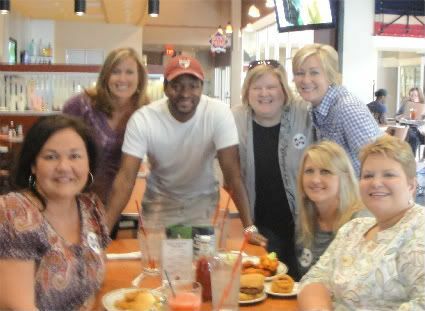 I don’t think he was expecting to be bombarded by a bunch of people he hadn’t seen in a sweet forever (in my defense, we are Facebook friends, so I felt perfectly comfortable SCREAMING HIS NAME ACROSS THE RESTAURANT), and we even got him to join all the State girls for a picture. After lunch we did some fun shopping at DSW (the booties were all the rage there, and we tried on LOTS of them), Nordstrom Rack and Marshall’s. We’re a diverse shopping bunch because some of us enjoy it and some of us have a low shopping tolerance, but we shared a unified shopping vision on Saturday afternoon. My lone purchase was a $12 pair of flip-flops, but I had a ball just looking at stuff. I wanted a cute pair of wedges for fall, and Melanie found them in Marshall’s – but they didn’t have my size. A strawberry Crave cupcake cured my disappointment. And for the record, Crave cupcakes are also made in heaven. Right next to Escalante’s steak marinade. 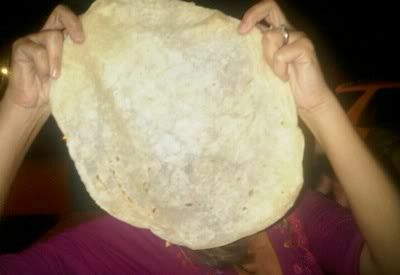 We saved Lupe Tortilla for our Saturday night supper, and it was hands-down one of my favorite nights ever. It was perfect, really. We had to wait a good while for a table, but we kept ourselves occupied by talking non-stop. We even sang a little bit. And when we finally sat down for supper at an outside table on a perfect early fall night, we had an incredible meal. We sang “Total Eclipse of the Heart” (I have no idea why). Merritt and Daph serenaded us with some classic Dixie Chicks (I have no idea why). We re-lived some of our favorite memories. We laughed until we wheezed. And I treasured every. single. second. There were several times this past weekend when I looked around at all those sweet faces and marveled at how God not only brought all of us together – He has kept all of us together. It’s a wonder, really. And for a hundred different reasons, I’ll never forget this past weekend. Just thinking about it makes my heart smile. 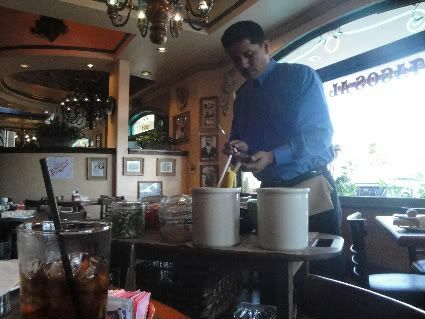 The food was wonderful. The weather was great. The shopping was fun. But the people? The sweet friends? It probably goes without saying, but I’ll say it anyway: they were the very best part of all. This past weekend I celebrated my birthday in Houston with eight of my favorite people on earth. 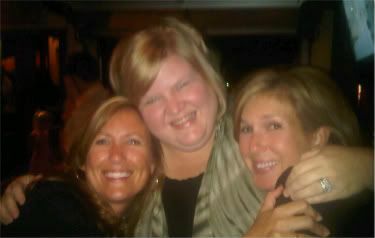 My sweet friend Merritt was an incredible hostess to all of us, and even though I can never thank her enough, I will die trying. Because ohmygoodness – she totally outdid herself. Just thinking about the last three days makes me all teary-eyed in the happiest possible way. But before I talk about All The Fun With Friends, I feel like I need to share a few preliminary facts. Please bear with me as I work through my chronic need to over-explain and wade through far too many unimportant details. I have lived long enough to know that “succinct” isn’t really my style. 1) I had never been to Houston before this weekend. I mean, I’d changed planes in Houston, but I’d never spent any time there that didn’t involve running up escalators and trying to catch a terminal shuttle. 2) I LOVED HOUSTON. It reminded me of Baton Rouge and Memphis, but it’s totally its own thing. And sweet mercy it goes on forever. 3) If I moved to Houston I would gain somewhere between 40 to 50 pounds the first week I was there. This is merely a conservative approximation. Results could vary. 4) And in all seriousness: the food was some of the best I have ever eaten in my life. I couldn’t get over it. I HAD NO IDEA. 5) I got home late this afternoon, but please let me assure you that I miss Houston already. In fact, I may ask Houston to be my BFF. I know it seems soon, but I think we forged a lasting bond. All righty. I’ll be back later with pictures and details and stories and much talk of food. For so many reasons, it was one of my favorite weekends ever. Seriously. What’s not to love? – I was distracted by the slight hint of fall in the air. – I was consumed with deep thoughts about the fact that there isn’t one person on “Real Housewives of D.C.” who makes me laugh. It’s a problem. How can a show be a guilty pleasure if there’s nothing pleasurable about it? Because then I just feel guilty. And I really don’t need Bravo to add to my ish-ahs. – I was solidifying my hair-related goals for fall 2010. – I was re-watching the Mississippi State / Georgia game. – I was trying to think of new and exciting ways to combine bacon and cheese. But at last – at long, long last – I have finally gotten around to posting all the bootie links that Melanie sent me a a few weeks ago. And I made sure that she wasn’t planning to use these links in a Fashion Friday, because, as I’m sure you can imagine, I’d hate for us to find ourselves in the midst of a dramatic blog stand-off with shocking allegations of improper usage of bootie links. Keep in mind that Melanie sent these links as inspiration. I like to look at the higher-end stuff and then find the most affordable alternative, always keeping in mind that comfort has to come first. So there you have it: my shoe-buying philosophy. No doubt your day is now richer than you ever dreamed. 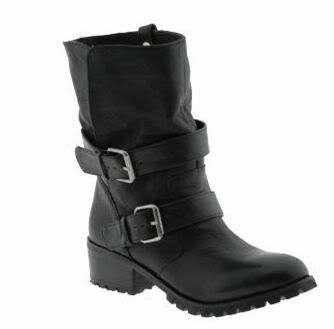 I thought these booties were super cute, but I didn’t think my recently injured ankle (HAVE I MENTIONED IT BEFORE?) could handle that strong of a wedge. These black booties were a little dressier with their kicky stiletto-ish heel, but the stiletto-ish heel and I parted ways several years ago and have yet to reconcile. I immediately fell in love with these cuffed booties and wanted to buy them and keep them forever. 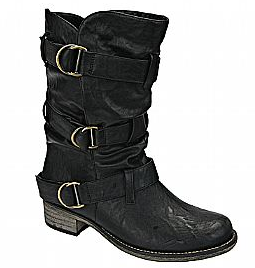 I adore the cuff, and I love that the buckles offer some adjustable options for those of us with calves issues. I made it my personal goal to find a more affordable option – and I’m tickled to tell you that I found one – but more on that in just a second. 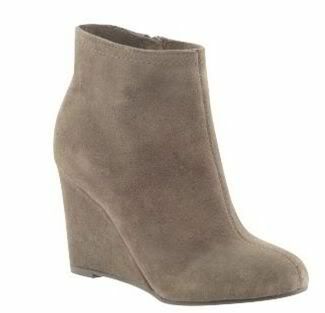 These suede booties are adorable, but my abnormally high arches would be miserable in them. Plus, the fact that they’re secured by some sort of burlap cord leaves me a little uncertain. These were a little bit more my speed, and I felt like they offered me some good inspiration. 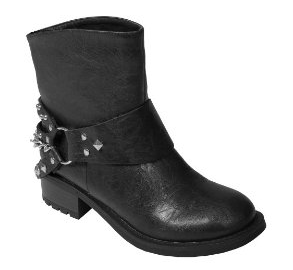 Melanie wrote “LOVE THESE” next to the link for these booties, and I think they are great-looking. I’m just a wee bit uncertain about a cuff that gets into the heel area, mainly because I think I would inadvertently get tangled up with some sort of stick-like object underneath that cuff and fall and break my collarbone as a result. Clearly I have great confidence in the area of poise. These were my hands-down favorite. BANANAS. Unfortunately I just don’t trust myself to wear them (see #6). So once I made my way through all of Mel’s suggestions (she really does have great taste, doesn’t she? ), I felt like I knew what I needed to look for in the more affordable versions. The first place I looked was the Payless website (LOOK. I ALWAYS FIND SOME REALLY CUTE SHOES THERE. 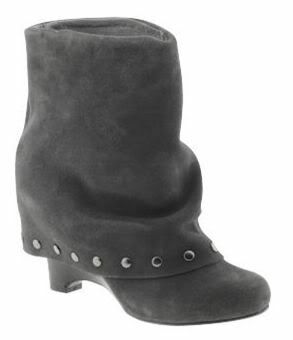 ), and I sent Melanie a link to see if these booties were acceptable. She responded that they were totally fine, but she suggested that I try them on first because I might find that I wanted to cut them off with a butter knife just to stop the pain. That’s a good word, my friends. – because of the sensible heel and the fact that my calves would be a non-issue. However, after some deep thought I remembered that I’ve never bought a single pair of shoes from Target that offered me any lasting comfort, and I decided that I needed to move on. Eventually I decided to look at the Rack Room website, and the booties looked so promising that I drove over to the closest Rack Room store. I had a GLORIOUS time, and I actually found several things that reminded me of the links Melanie sent me. 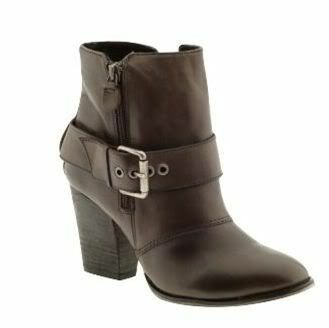 These cuffed booties are also adjustable in the calves and seem really versatile to me. I loved these booties so much that I bought them. They come in black, too. Super comfortable and great-looking with leggings or jeans. And these are really cute on the foot – though not as much in the picture – but I think they’re a great option if you want a bootie that’s more like a regular shoe. 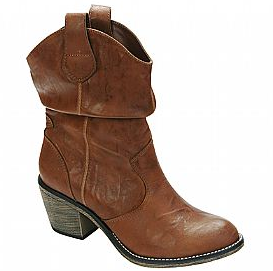 I also bought a pair of booties from Rack Room that look a little bit more like cowboy boots, but they zip on the sides, which is a huge help to someone like me who has a difficult time getting my abnormally high arches wedged down into a flat boot. The side entrance makes it so much easier. So there you have it. A 2010 Booties Extravaganza. I’m ever-so-thankful to have a sweet friend like Melanie who will spend upwards of two hours on a Saturday morning consulting with me about all my bootie-related needs. 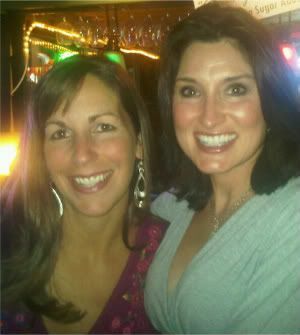 Remember – like it says in Proverbs – a friend loves at all times, and a sister is born for booties research and support. I have it on very good authority that Melanie‘s birthday is tomorrow. The source of that good authority? MY CALENDAR. And here’s a little secret (well, it’s not really a secret, but we can certainly pretend that it is for the sake of narrative) that you may not know: Melanie and I actually became friends way back in the bloggy day when she left a comment that referenced two of my favorite topics, football and worship music. You should know that I love her comment for many reasons, but the fact that it’s from “Melaie” is the icing on the comment cake. We have since developed a wide-ranging repertoire of words we frequently mistype, and “Melaie” was just a small taste of many typing-related hilarities to come. Warms my heart, it does. And thus a friendship was born. Also, I just noticed that Mel actually left that comment in August of 2006. Which means that in addition to tomorrow being her birthday, it’s also a pretty good time to celebrate our friendiversary. Maybe P and D can throw us a party. We can meet halfway between Birmingham and San Antonio and share a box of Cheez-Its and a couple of Route 44 Diet Cokes from Sonic. P can shoot some wild game for us, and then D can analyze the overall strategy, execution and success of P’s shooting and put all the data in a spreadsheet that we’ll have lacquered onto a commemorative plaque. It’ll be a precious time. For the last four years Mel and I have emailed and talked and cried and laughed like nobody’s business. We’ve covered a mind-boggling amount of conversational ground (however, I can’t recall that we’ve ever talked about the proliferation of nuclear arms, but then again we’re not really what you would call well-versed in foreign affairs). And even though it’s a little bit of a cliche’ to say that you don’t think you would have made it without [fill in the blank], I cannot imagine what I would have done without her. 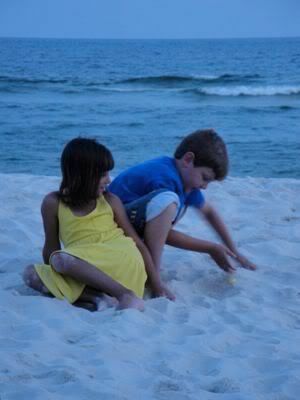 We could have never known it back in August 2006, but God had some crazy adventures waiting for us. And the fact that a couple of borderline introverts with a host of confidence issues and a deep love for reality television managed to set aside our fears and our remotes long enough to forge a lifelong friendship will forever be a wonder to me. I think that God knew we would need each other. I’m so grateful that He did. So all that to say: Happy 39th, Big Mama. You are an incredible wife and mother. You are a loyal and steady and trustworthy friend. You are more talented than you know. You are, in the words of our pretend friend Rachel Zoe, BANANAS. And your friendship is the best gift the internet ever gave me. 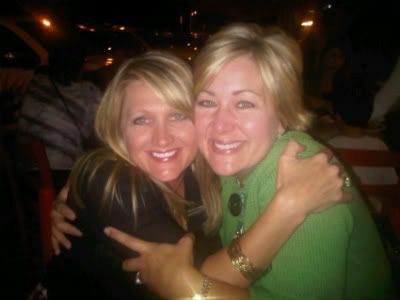 Here’s to many more memories, sweet friend.